The Maxim’s Go-IO is an automated equipment, that has self-diagnostic and optimization capabilities to fully utilize the industrial convergence. The device can be actively report its equipment health and status information via its RS-485 communication channel to enable live monitoring that will help in achieving high throughput and productivity. 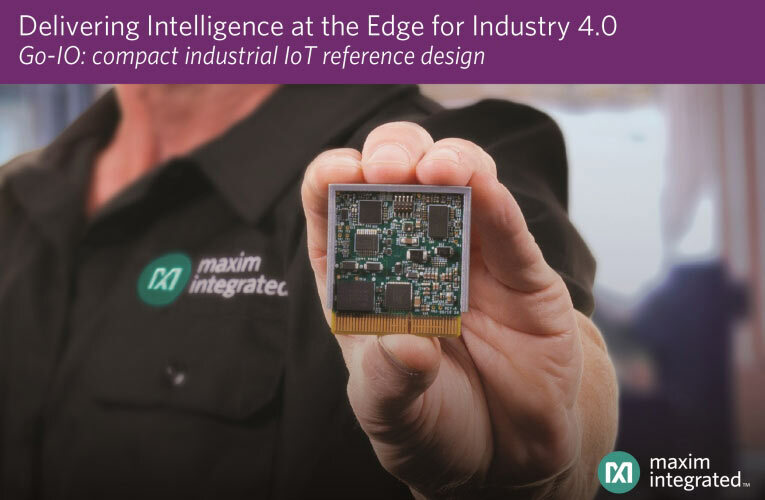 Maxim also claims that their Go-IO is 10x smaller and consumes 50 percent less power than its predecessor Pocket IO which is currently being used widely in industries. With 12 highly integrated IC’s and supporting upto 17 IO pins including a 4-channel IO-Link master that could support both analog and digital sensors the Go-IO could communicate with a robust speed upto 25Mbps using its isolated RS-485 communication channel which is reliable for time sensitive applications. This flexible and rugged nature of the device makes it ideal for industrial automation, building automation and even for industrial robotics applications. The device uses the MAX14819 for IO-Link master transceiver and the MAX22192 for 8-channel SPI communication. The MAX14912 is used for featuring high-side switching and configurable outputs capable of 200 kHz switching frequency and 640mA output current. The RS-485 transmission at 25Mbps is achieved by the MAXM22511 and MAXM15462 IC is used for designing a small yet simple power supply for the module. Currently Go-IO is priced at $495 and is available for purchase from the maxim’s website. You can also get the reference designs for the baseboard and Go-IO module from there.